I began after lunch at Zeke’s Roast Beef on 3rd and 77th. 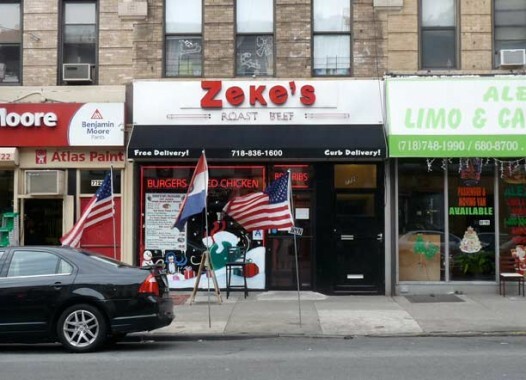 My history with Zeke’s has been mentioned ad infinitum here before, so I won’t tell the story again, but it’s some of the best fast food in Brooklyn and I ate there once a week from 1982 till I moved in 1993. After finishing lunch, I spoke to the owner, who was outside and I congratulated him on the recipe staying exactly the same after a few years’ hiatus after they left their original location (see below). He remembered me as regular customer. I can’t be anymore, but I go in whenever I can. There have been some changes on 3rd Avenue. Cangiano’s, which was on the corner of 3rd and Ovington for quite awhile, has left the building. 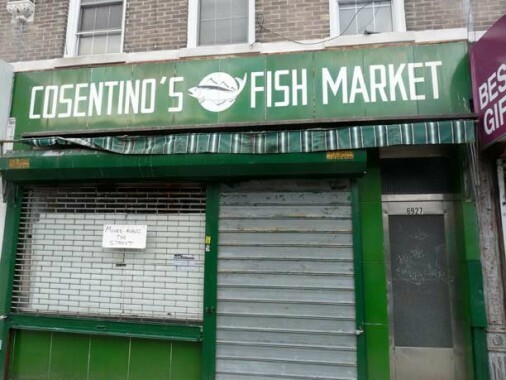 A couple of doors down, the similarly-named Cosentino’s Fish Market has moved across the street, which means its classic green and white sign will soon be gone. 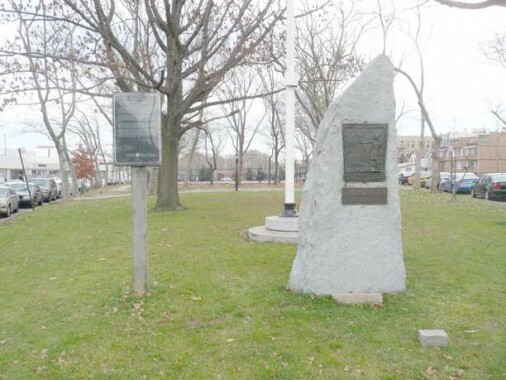 Bay Ridge and Sunset Park used to have a high Scandinavian population; there was a lot of dock work and many immigrants worked on the waterfront. 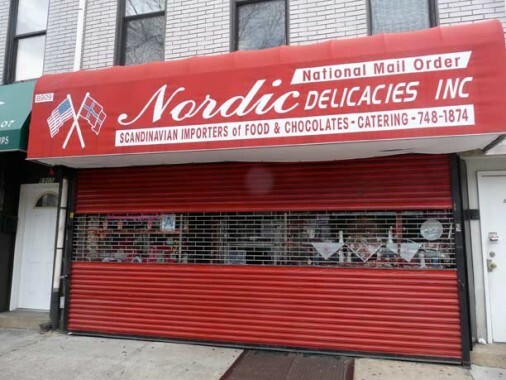 Many of the Norwegians, Swedes, Danes and Finns of southwest Brooklyn have moved away (there are still more than you’d think!) and the Norwegian Day parade, commemorating independence from Sweden, is still held in May. Along the way we will see some Norse vestiges. Leske’s Bakery recently closed (my mother’s bakery of choice, Lund’s, is very long gone), but this gift shop on 3rd near Bay Ridge Avenue (69th Street, as the locals say) is still in business, though not open this day. In a world of Walgreens, CVS and Rite Aid, the neighborhood pharmacy is still a welcome institution. Lowen’s Pharmacy saw tragedy a few years ago, however, when one of the owners committed suicide after he had been implicated in a steroids scandal. A couple of buildings on 3rd Avenue have retained their corner turrets and complicated roofline corbelling, and thus, advertise their century-old lineage. 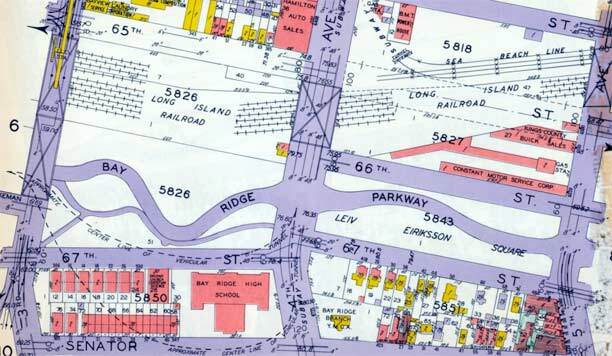 Lower Bay Ridge developed as a small town relatively early on, by the 1850s. 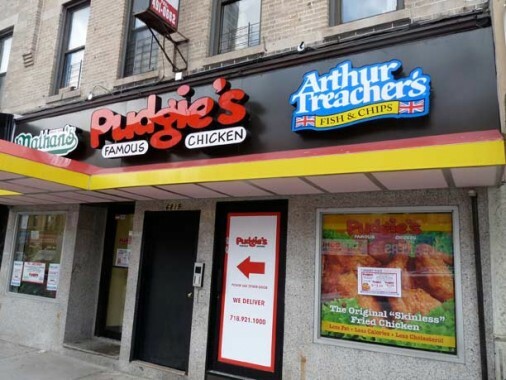 Arthur Treacher’s Fish & Chips used to have a lot greater coverage than it does today, when it’s down to a handful of outlets, and this one has to share space with 2 other fastfood joints. Treacher, by the way, was a real person, a British actor who got a lot of work in light comedies of manners from the 1930s-1950s, playing butlers (most notably P.G. Wodehouse’s Jeeves, who became the symbol of ask.com) and military men. I’m old enough to remember him primarily as Merv Griffin’s dry sidekick on his evening show on Channel 5, which my mother would rarely miss. Late in life, he licensed his name to the fish & chips slinger, though he had little other to do with the place. The Bay Ridge (twin) Towers are apartment buildings, seen here from 3rd Avenue and from Shore Road Drive, that went up in the early 1970s. Outside of downtown, they are still among Brooklyn’s tallest buildings at 30 floors apiece. Both are built on platforms above the NY & Atlantic (Long Island Rail Road) tracks, which are sparingly used for freight. One of Bay Ridge’s relative secrets is the scenic Shore Road Drive, which first appears on maps (like this Belcher-Hyde plate) in the 1920s, running from Shore Road at Owls Head Park all the way to Fort Hamilton Parkway. 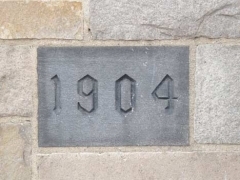 It was first called Bay Ridge Parkway, but some time after 1929 a switcheroo was made and 75th Street became Bay Ridge Parkway, and this became Shore Road Drive. 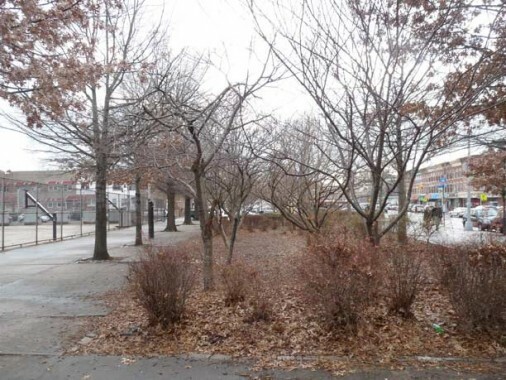 The road used to run all the way through Lief Eiriksson Square to Ft. Hamilton Parkway, but as likely part of reconfigurations after the Belt Parkway was rammed through in 1940, Shore Road Drive was cut back to just east of 4th Avenue, where its traffic now feeds into 66th and 67th Streets. It was also straightened quite a bit and now connects directly with the Belt just past Colonial Road. A legacy of the 1920s construction are the graceful arches that take 3rd Avenue and Ridge Boulevard over the roadway; these are new construction that closely matches the originals. Until 1940, the 5th Avenue El once ran over this arch to its southern terminal at 67th Street. Leif Ericson (c.960-c.1020) was probably the first European to set foot on the American continent, nearly 500 years before Christopher Columbus’s voyages. Ericson was born in Iceland around 960, the son of Eric the Red, an Icelandic king who discovered and colonized Greenland. 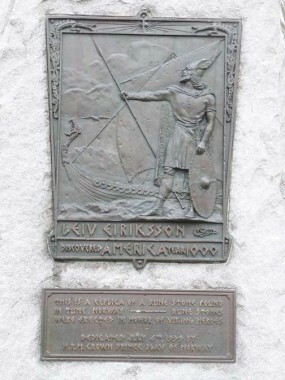 The Icelandic Sagas offer two explanations of Ericson’s famous voyage. One suggests that Ericson, en route to Greenland, was blown off course and arrived on the northeastern coast of America. In the other, he organized an expedition to confirm a previous report of hilly, heavily forested land west of Greenland. 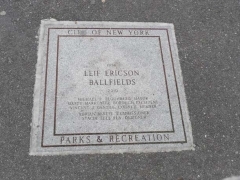 Lief Ericson, or Leiv Eiriksson, Square runs between 66th and 67th Streets as a corridor park between 4th Avenue and Fort Hamilton Parkway; its length was interrupted by the Gowanus Expressway beginning in 1959. It is named for what is thought to be the first European to sight the North American mainland, more than a millennium ago. This is a replica of a rune stone found in Tune, Norway. Rune stones were erected in honor of Viking heroes. Native Americans reading the sign may be perplexed about all this business about Lief Ericson and Christopher Columbus discovering America when they had done it centuries earlier than 1000, but that is a discussion for a different website. That was built as Salem Lutheran Church. Locally, it was known as Swedish Salem, as opposed to Danish Salem on Ovington Avenue. The church was sold about 2 years ago to a ongregation from the west. I do not know its current name. 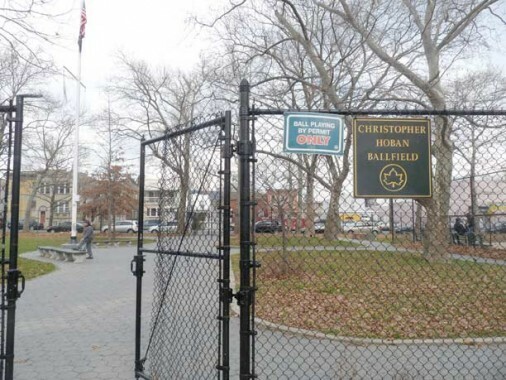 Between 6th and 5th Avenues, Leif Ericson Square has some mixed-use ballfields named for 26-year-old Police Officer Christopher Hoban, killed in a failed drug sting in Manhattan Valley October 17, 1988 in the wild west atmosphere NYC was in those years. 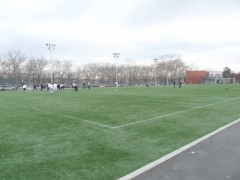 A five-mile memorial run is also held in Officer Hoban’s name in Brooklyn each September. 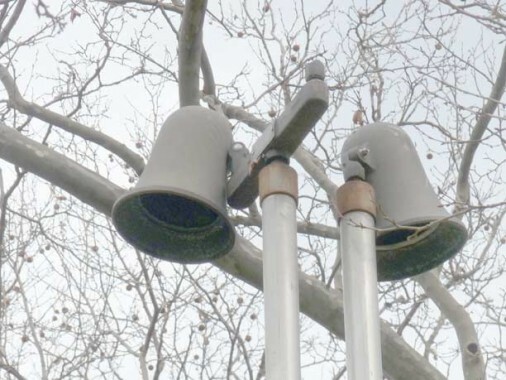 A park post holds a pair of old-style mercury vapor park lamps. These really didn’t do much to illuminate the basketball courts and other park areas, so within 10 years most were supplanted by much stronger sodium vapor lamps. There are still a few of the mercs around, working or not. 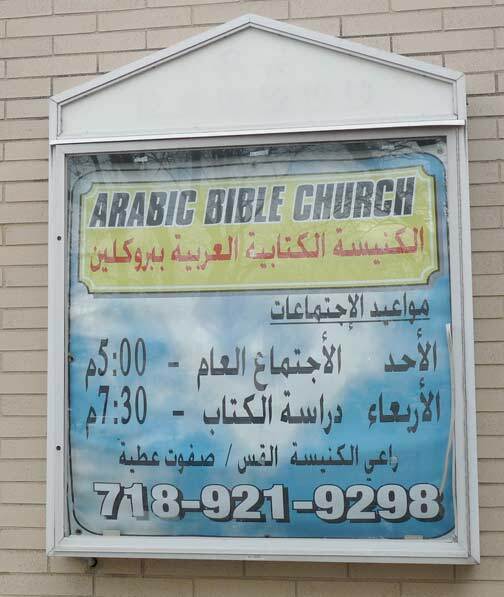 The First Evangelical Free Church, 6th Avenue and 66th Street, built in 1962, has services in languages for everyone –there are signs in English, Norwegian, Arabic and Chinese. 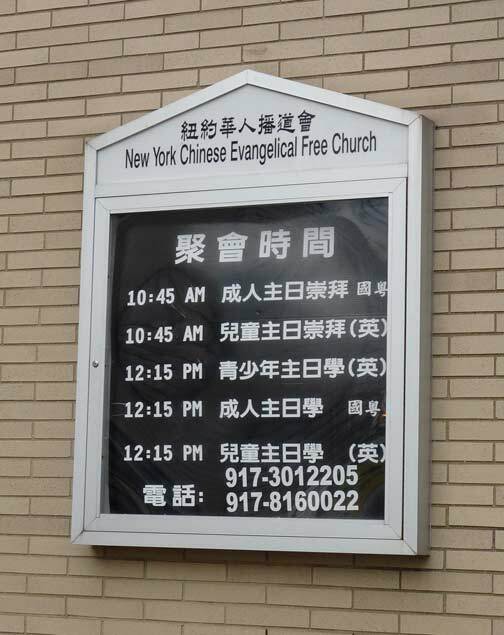 It’s good to be as helpful as possible when your church is at a corner that reads 6-6-6. This group of dull, nondescript buildings at 6th and 66th doesn’t look like much, but it’s the site of many happy childhood slurpings from the Karl Dröge ice cream shoppe, which hung in there well into the 1990s, when I would get a vanilla cone after 4 or 5 hours of pedaling through the unknown hot and humid wastes of Brooklyn and Queens. 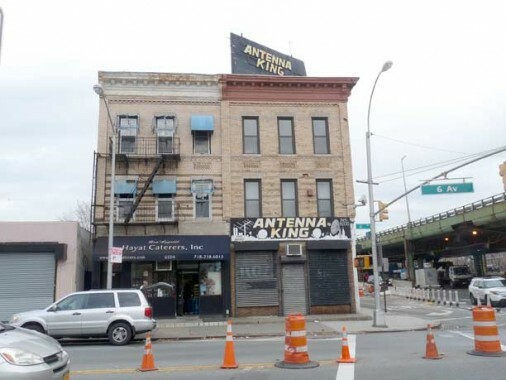 The Antenna King, Henry Langan, ruled the rooftops of Brooklyn from founding the store in 1967 at 6th Avenue and 65th Street on through the rooftop satellite dish era in the 1970s and 1980s. It’s little remembered now, but for decades, cable TV was unavailable anywhere but Manhattan and to get special programming like sports, bars and restaurants relied on satellite dishes. Cable TV finally came to Bay Ridge in 1987 and I was among the first subscribers. Pay TV was weird at first though. 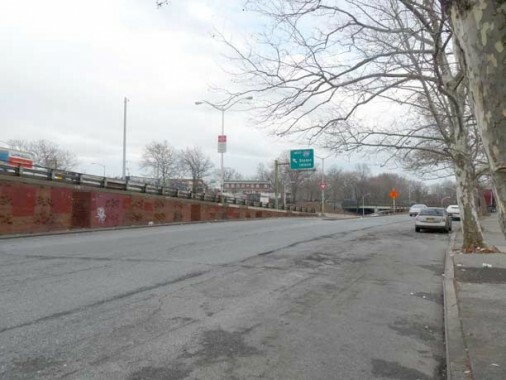 A short stretch of road-that’s-not-65th-Street runs along the west side of the Gowanus Expressway to 7th Avenue, with an on-ramp. 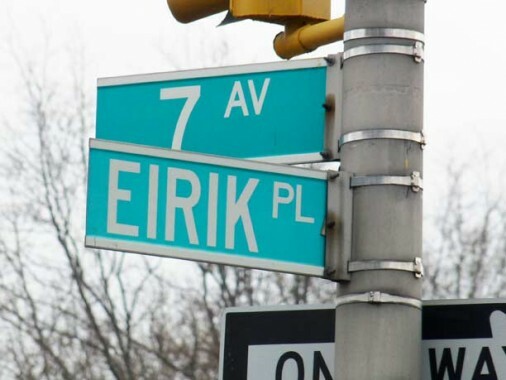 It was bestowed the name Eirik Place, after explorer Eiriksson. The diner is a fine example of [diner manufacturer] DeRaffele’s 1982 Mediterranean style, with a red tile mansard roofline, large round-top windows, and white stone facade. Take special note of the spinning sign out front. The diner is open 24/7 and has a huge menu. 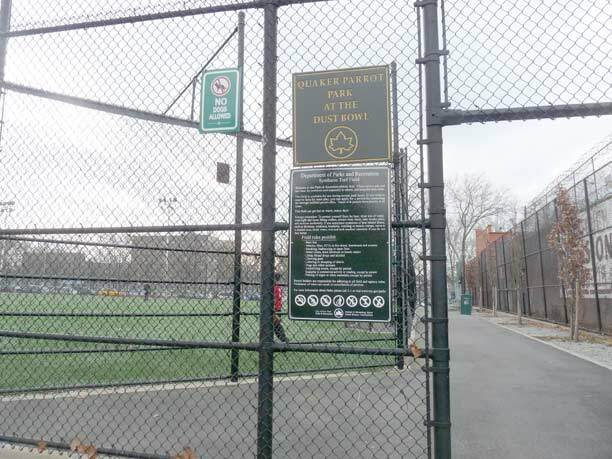 At 8th Avenue and 65th Street stands the Dust Bowl — or rather, officially, Quaker Parrot Park at the Dust Bowl. For decades, nothing would induce grass to grow on this field, used by all sports — my father would take me to soccer matches here when I was a kid. Finally in 2010 it was remade with artificial turf. Quaker parrots, which like to nest in high places, use the light stanchions as living areas. 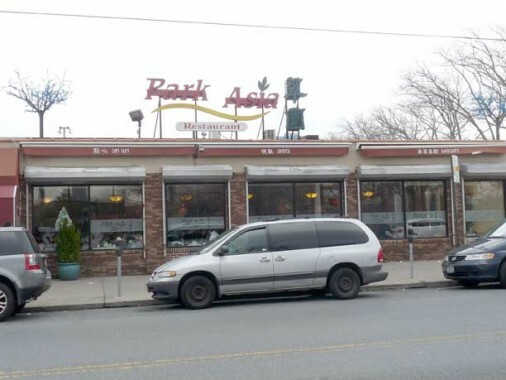 For years without fail–from 1982-1993 every week on a Monday or Tuesday– I would troop over to this diner for a meal. When I worked nights I’d go before work, and when I worked days, I’d go after work. That, though, was before 2004 when what had been Zeke’s Roast Beef turned into Park Asia. Zeke’s had been there since the early 1970s. This site, on 8th Avenue and 64th Street, is the former site of the 2001 Odyssey disco, where interiors and exteriors for the 1977 movie Saturday Night Fever were filmed. The disco later became The Spectrum; in the mid-2000s the building was razed and this wholesaler built on the site. 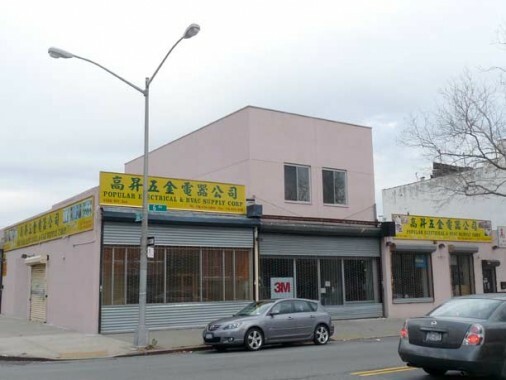 Lesser-known was the building directly across 64th Street, which had been the Bay Ridge Bowl till the late 1980s. I bowled three games there in that decade and almost choked from the smoke. 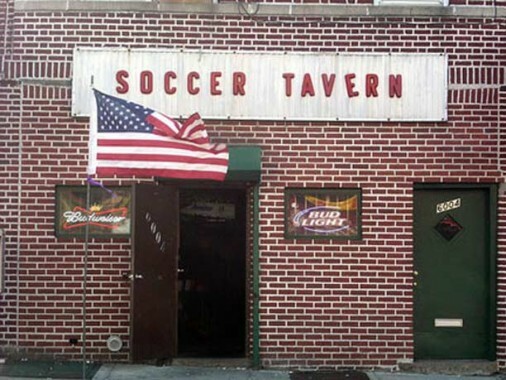 Soccer Tavern, 8th Avenue near 60th Street, was likely named for the nearby soccer fields at the Dust Bowl. It has served a variety of nationalities over the years. 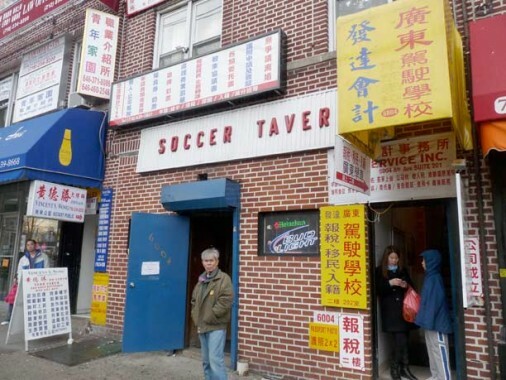 It has been the Soccer Tavern for over seven decades and now has a mixed Irish and Chinese clientele. Only in New York kids! 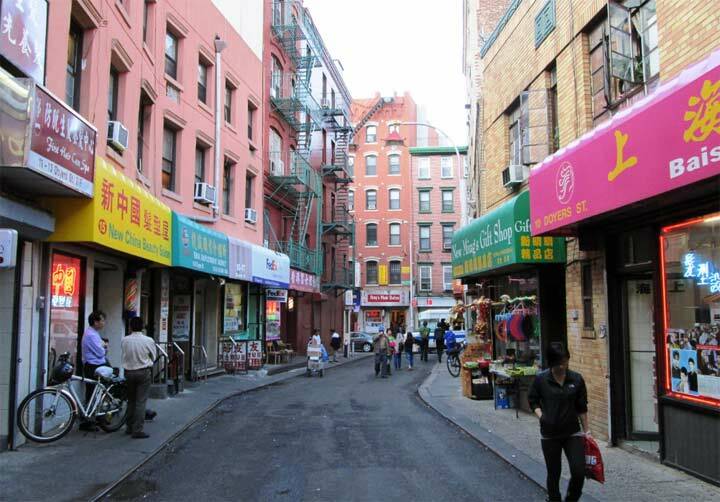 A happy coincidence was the flowering of NYC’s Brooklyn Chinatown on 8th Avenue. In China, 8 is a lucky number. 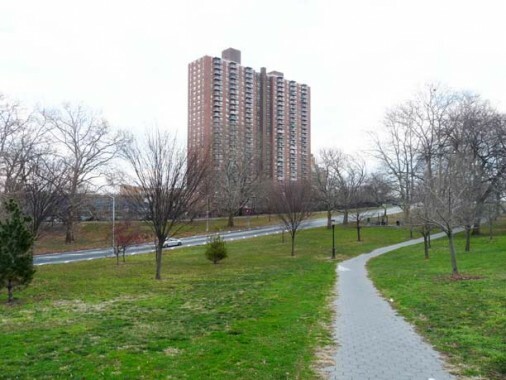 Between 58th and 60th Streets a triangle is formed by Ft. Hamilton Parkway and 10th Avenue, which approaches it from an angle. As long as I can remember, the triangle has been occupied by a fresh fruit store. This hulking warehouse at FHP and 60th Street has architectural touches that likely date it to the Roaring Twenties. In the 1960s the ground floor was home to a Pontiac dealership and in the 1980s, it was a roller rink called the United Skates of America — still an existing chain. 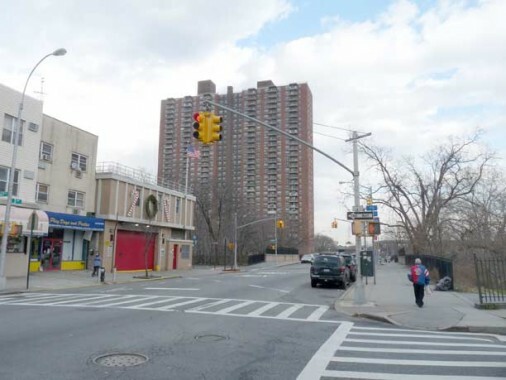 Until the 1980s, 10th Avenue traffic was allowed to merge with that of Ft. Hamilton Parkway. Today, 10th Avenue is only open to traffic from 59th to 61st Streets (10th Avenue resumes a few blocks north at 52nd Street, and south of the BMT railroad cut, it runs from 62nd to 86th Streets.) It became a large pedestrian plaza, Bocchino-Dente Square. In the 2nd photo, you can see the line of 10th Avenue buildings running north to FHP. Bocchino and Dente were likely area war casualties, though the internet has nothing on them. 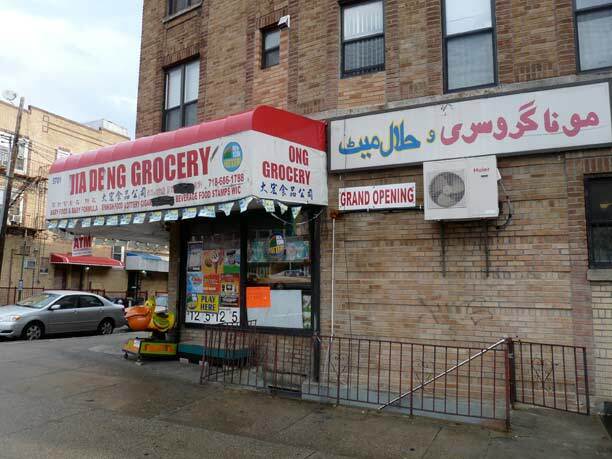 Here, on FHP in the upper 50s, we’re on the cusp of several neighborhoods: Chinese Sunset Park and Hasidic Borough Park, and in between there’s a substantial Arabic speaking population. 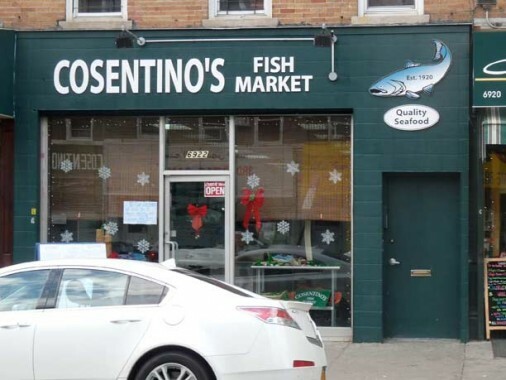 – Cangiano’s at 3rd and Ovington hasn’t been there as long as you may think. 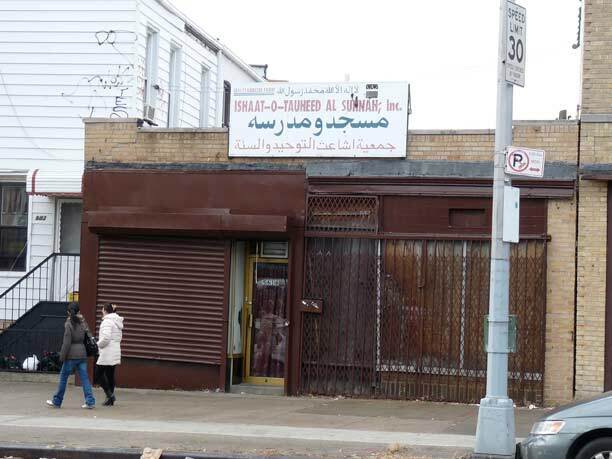 The first floor of the corner building was extended to the south, taking over part of the very wide sidewalk there, in the late 1980’s or possibly even the early 90’s, when the store was built after a fire in the corner building. 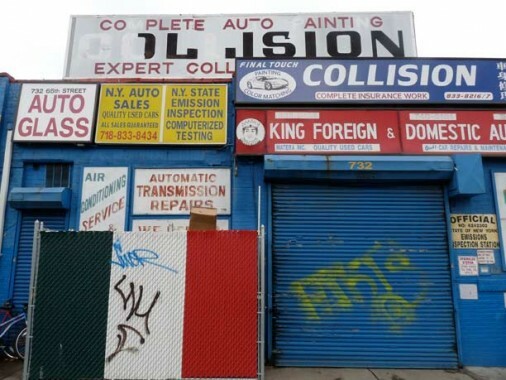 Originally, it and the store next to it, “Best Body Work”, were one store, and took up the width of two buildings. It was called “Davena’s” I believe, a family clothing store, or “Dry Goods” store, as they were called back in the day. – Nordic Delicacies is more than a gift store. 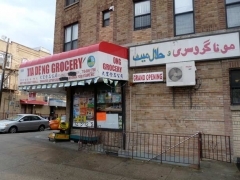 It carries various types of food items, including nuts, spices, breads, and home cooked foods and cakes. – The “graceful arches” that carry 3rd Ave. and Ridge Blvd. 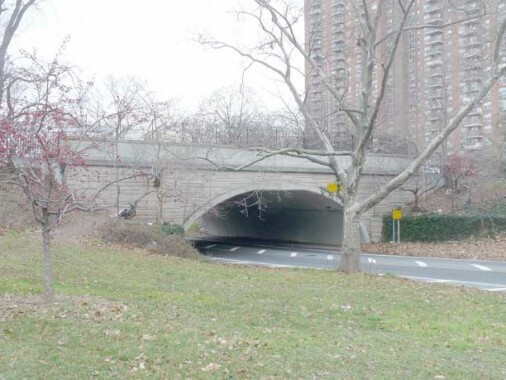 over the Belt Parkway approach road are not original, having been reconstructed in the recent past. They are actually precast concrete arches with a stone-like facade hung on them to keep their original look, a nice touch by the DOT. – 71st Street between Narrows Ave. and Shore Road is also called Christopher Hoban Way. Xaverian HS hosts a barbecue in their parking lot at Narrows and 71st after the annual Chris Hoban Run. 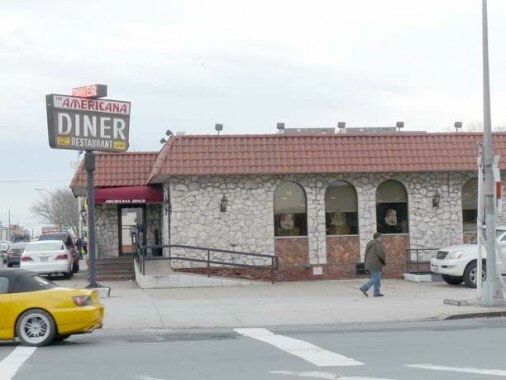 – The American Diner at the corner of 7th Ave. and 65th St. is now boarded up and fenced off. Maybe it’s closed for good, as it doesn’t look like any renovations are planned since it closed several weeks ago. Sorry to hear about the Americana…. The fruit and vegtable market on Ft. Hamilton and 60 street used to be a Oldsmobile dealership back in the 70s and early 80s. I bought a cutlass ciera from there in about 1982. It was called Lind Oldsmobile. If I remember correctly, it had an old Oldsmobile Curved Dash runabout in the showroom. My father bought a 1950 Oldsmobile 98 from Lind Oldsmobile late in 1949. I still have it in the garage, though my father has since passed on. My Grandfather opened Lind Oldsmobile in 1938. Bob, I would love to see that car! 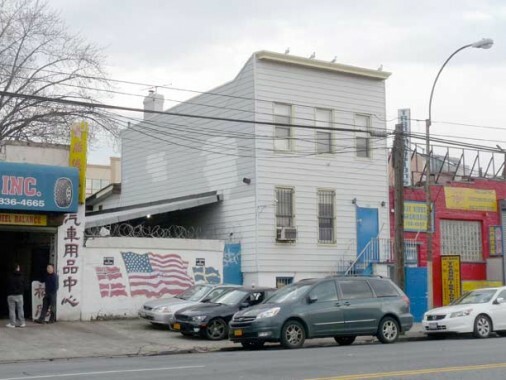 The building you refer to as Gjoa soccer club on 65th St between 7th and 8th Avenues is actually the Swedish Soccer Club building, The Gjoa Sporting Club building is located on 62 St. between 8th and 9th Avenues. Thanks for that. I updated the page. There’s nothing on the interweb about the Swedish Soccer Club though. these photos are so, so newyork! just no adjective, i can find more: i truly love this article as well as others at this site. We played many a baseball game at the dust bowl during the late ’60’s. You’re correct in saying neither grass nor weeds would grow in that dirt. I remember that restaurant across 8 Ave as a no-name burger joint. The Karl Droge ice cream store was a regular family “evening out” for us. Maybe play some catch with Dad across the street in the playground. 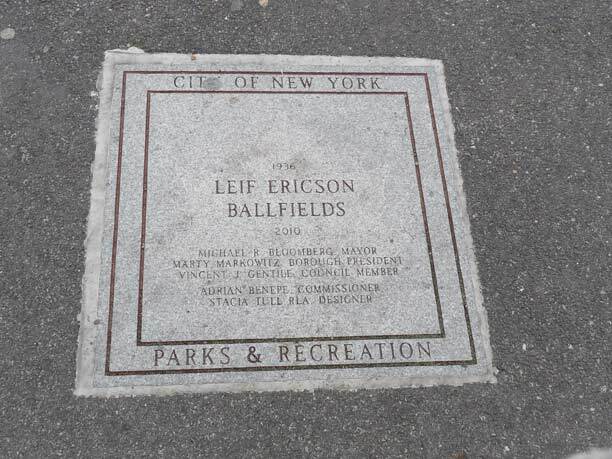 No one ever called that 5-block string of asphalt “Lief Erickson” park back then. 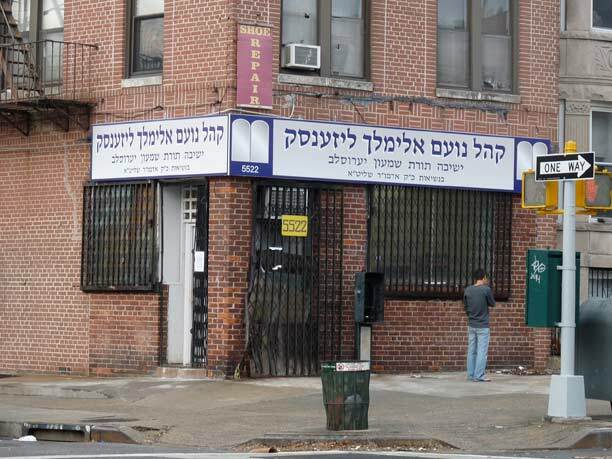 I remember when that (now) EV church on 66th and 6th was built in the early 60’s. 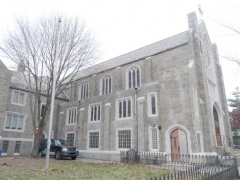 It was strikingly different from the traditional Catholic and Methodist churches everywhere else. That church did host the youth group mission from from our EV church in Utah about 4 years ago. I think Carolyn lives here in Vermont, Mary. Are you Mary Andres from Bay Ridge? I seem to remember you and Violet ? And Andres catering? It’s me Marlene (nee Papa). Carolyn is on the web- she’s an artist.You remember how much she loved drawing cows as a kid. Hope you and Violet are well. Violet here. Can’t believe it’s 2014 and I just found this posting. If I remember correctly you married and moved to California I can’t recall when you moved out of the house on 85th Street. I often ran into your mother in the 1970’s in the neighborhood but lost contact with her. How is your brother Frederick? When I saw this posting I felt all warm and fuzzy, remembering our childhood. The wonderful boat that your grandfather carved for me, bike riding, sleep-overs, your mother braiding our hair for Sunday morning church, trick-or-treating, I have a photo of the 2 of us, and so much more. Do not know if this is still an active site and you will be able to read this. I hope so. I just now decided to look at this website again and there was your email. It is so good to hear from you. I hope you all are doing fine. Are you still living in Brooklyn? My husband, Christopher retired last June and we decided to move to Portland, Oregon. It is so beautiful up here and it rains a great deal in the winter. After living in a mini drought for 2 years followed by 4 years of a serious drought, it is just fabulous to here the sound of rain and thunder. My parents moved to Tennessee back in the 80s, however they are both gone now. Dad died in 1986 and Mom in 2004. Fred is a sad story. He and his wife and daughter perished in a house fire in 2002. They were living in South Carolina at the time. It took a long time to get over the shock!. If you should get this, please reply with your email address as it would be great to keep in touch. And, if you decide you would all like to visit the Pacific Northwest, just let me know when. Your picture of the Antenna King brought back and odd childhood memory. Does anyone else out there remember that giant mesh king-holding-the-antenna sculpture on the roof? It was there ever since I could remember driving past it on the expressway. When did they tear it down? It was practically a landmark. Yes, Kevin, it is definitely a topic for another web site: The so-called “Native Americans”, interlopers to the North American continent via the Bering Strait, were not the first to settle here. The original settlers were the Solutrean people from southern Europe via the Atlantic ice bridge, ca. 17,000-20,000 years ago. On the Belcher Hyde map, check those dashed lines with the notation “approximate center line of vehicular tunnel”! 450 67th St was purchased by “St Matthew’s Churches” of Tulsa OK. According to wikipedia it’s a bit questionable if it’s a “real” church or an evangelical mail-order operation that needs a couple of physical locations for tax purposes. 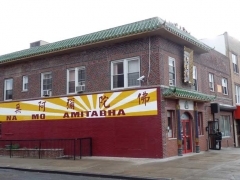 I remember that joint…Warm Beer, Lousy Food on the outside wall. The Crazy Country Club was one street before 2001 Odyssey on the corner. 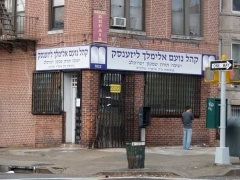 It was on 7th Avenue and 64th Street. And 10 cent soda. On Saturdays they ran a special, for a quarter you got 2 slices and a soda. After we played stick ball or softball, that’s where we headed for. Those were the days. The story brings back good memories. In the late 50’s/early 60’s, my father would take us for a drive around Shore Rd,, maybe to Owl’s Head Park. 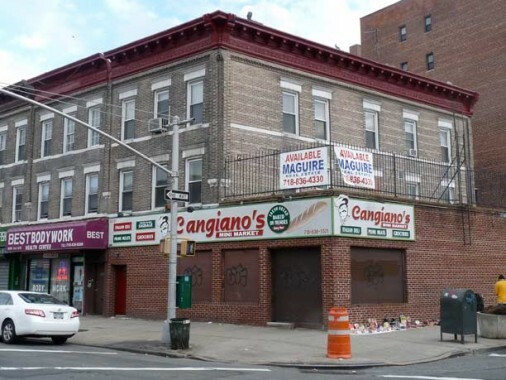 Then we’d go up Shore Road Drive and stop for Italian ices at a stand on the corner of 4th Ave. and 66th St. 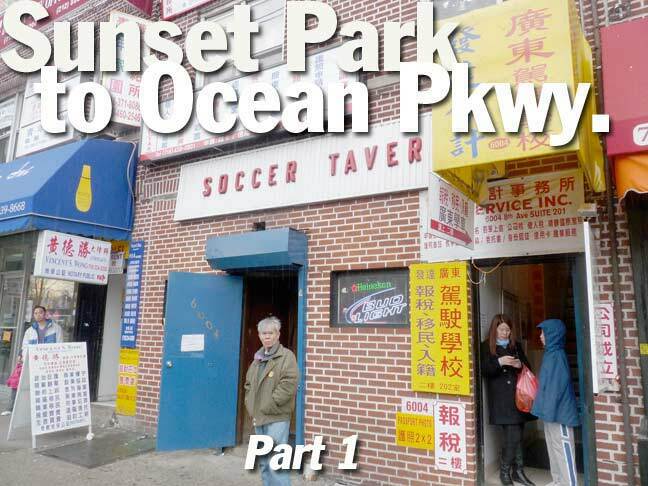 I never thought of that area being Sunset Park. I remember sitting in a classroom at New Utrecht HS watching the sun reflected off the east tower of the Verrazano Bridge as it was under construction. Brooklyn was a great place to grow up! 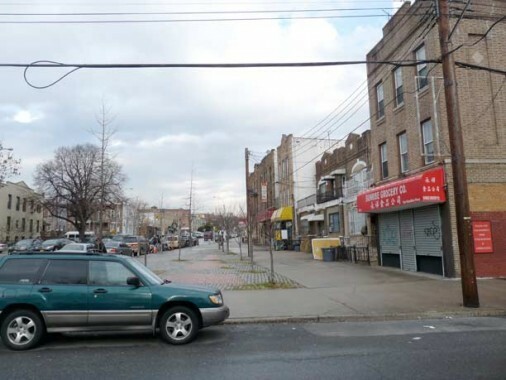 The fruit stand was Lind Oldsmobile, which was there for decades at 60th and Fort Hamilton. They eventually sold Hyundai too, I believe. They closed about a decade ago, at least, and Oldsmobile went defunct a few years after. If I remember correctly Lind was at FHP and 65th Street. Kevin, you are correct. 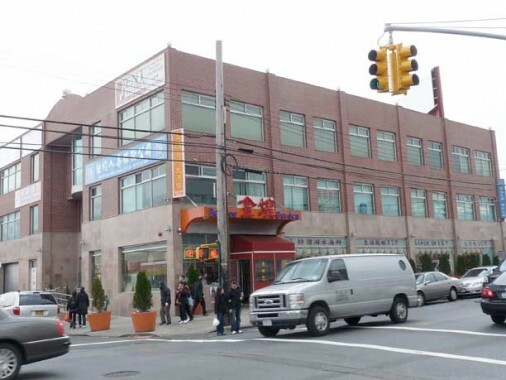 The Lind Oldsmobile showroom moved from 4th Ave & 64th Street to Fort Hamilton Pkwy & 60th St. in 1968. 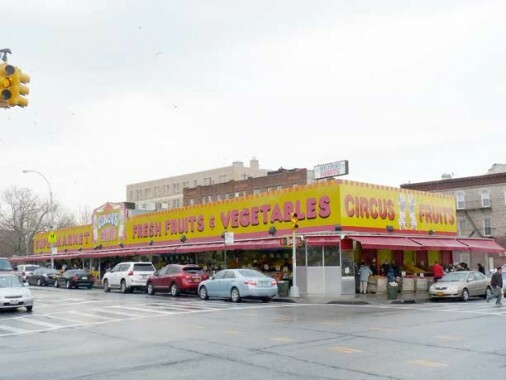 The site has been a fruit and vegetable store since 1996. The Belcher Hyde map shows the last stop of the 5th ave el, on 3rd ave at that point. The structure continued south for a bit and there was a ramp to the street for streetcars, which ran up into the el station. There is a short stub street opposite Senator St, just visible on the left side of the map which was the route of the ramp. I lived on Senator St at that corner from 1950 – 55. The large building at FHP & 60th Street was originally a Roger’s Pontiac dealership. The biilboard on the roof had the Pontiac emblem (Indian with feather in his hair), and in script, in red neon: “Roger’s Pontiac.” Over time, the dealership changed over to selling Ford; the rooftop advertising remained. The main entrance had a mosaic on the floor of the Pontiac Indian head which remained intact. Another defunct Pontiac dealership at 450 Broadway, Brooklyn, has the same mosaic on the entrance floor. I noticed it when it was G & I auto parts, a few years ago. I remember when it was Pontiac. The Rogers Pontiac building was originally built by Borden in the early 1900’s. Horse drawn carriages would distribute milk to much of the area from here and the horses were housed on the upper floors. 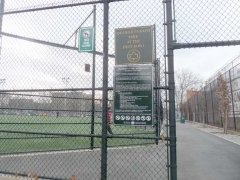 I ATTENDED PS 127 AT 7TH AVENUE BETWEEN 78TH AND 79TH STREETS, JHS 259 (MCKINLEY JUNIOR HIGH SCHOOL) AT FORT HAMILTON PARKWAY BETWEEN 73RD AND 74TH STREETS , AND FORT HAMILTON HIGH SCHOOL AT SHORE ROAD BETWEEN 83RD AND 85TH STREETS. AT ALL THREE SCHOOLS, ONE OF MY CLASSMATES WAS CAROLYN DROGE, DAUGHTER OF KARL DROGE, THE OWNER AND OPERATOR OF THE DROGE ICE CREAM COMPANY. AT OUR VERY YOUTHFUL AGES, WE WERE SORT OF AN “ITEM”!!! I MISS THOSE WONDERFUL YEARS. Oh really Charles Frey??? I did not know that. Just because you were two of the tallest kids in the class!? Remember when we would get ice cream from Droge’s in our class? I went in to the SP program and lost touch with all my PS 127 classmates, but recently met up with Carolyn, her sister Margaret and her parents – all of whom had moved to Vermont. Carolyn was always the best artist in school and now she is a pretty well-known and extremely talented artist. I remember you! Just came across this posting. Yes, the Mary who posted the original message is my sister Mary Andres of Andres Catering (long-gone now) Saw a picture of Diane, Cathy, and Dora recently. Will be seeing them at Ft. Hamilton’s 50th reunion. I do hope that 2 years later you still get this reply. 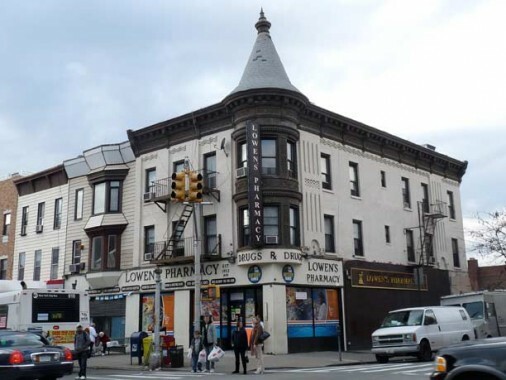 Does anyone know the name of a ice cream parlor on newutrech ave around 58th street back in the 60s? 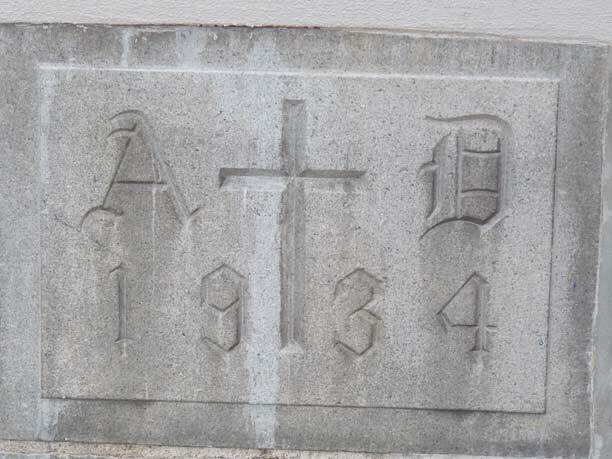 The “Forgotten Church” on 67th Street was indeed Salem Lutheran. There was a school there from the late 1960’s until 1973. 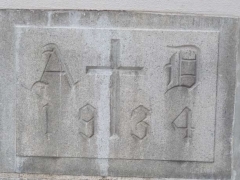 The school is Leif Ericson Day School which is still at Bethany Lutheran on 72nd Street. I attended that school from 1969 until 1976, and helped move it from Salem to Bethany. The founder of the school was a Dr Benz (unsure if that was the spelling, but that’s how it was pronounced). There was a pastor after him whose last name sounded like “Voosen” or “Voozen”. 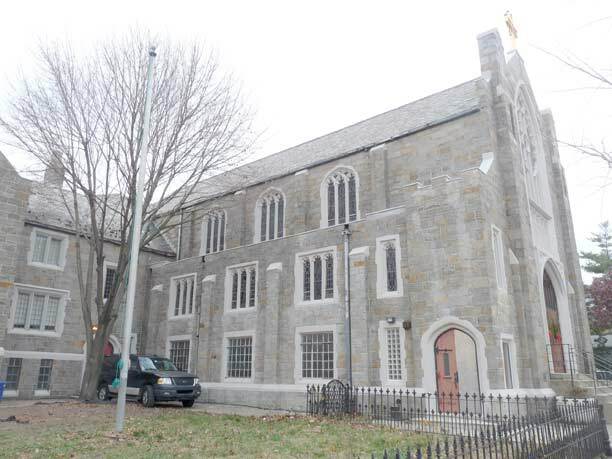 The church also owned the house next door to the left of the building, which was used for classes of the school. (The school moved because Salem wasn’t big enough). I remember the house had grapes growing in the backyard. I also belonged to the scout troop that was there, again in the early 1970’s, it was troop 316. I am researching my grandparents and learned they were married in:The Norwegian Evangelical Free Church, Leiv Eiriksson Square, 649-66th Street and Annex Church, Flatlands Ave and E 40th, Brooklyn, NY This info came from a character reference letter for my grandfather dated Sept. 14, 1943. 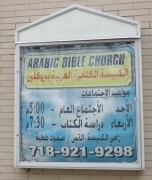 Does this church exist? This Hoosier gal would appreciate any information you have. 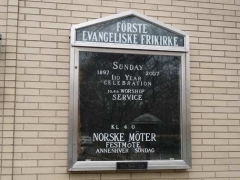 I believe the Norwegian Evangelical Free Church your grandparents were married in is now the First Evangelical Free Church – Brooklyn at 66th St. & 6th Ave. in Bay Ridge. 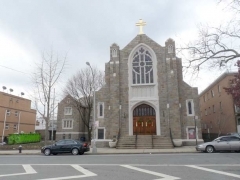 The church building your grandparents were married in was demolished to make way for the Gowanus Expressway. 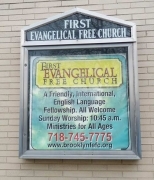 First Evangelical Free Church – Brooklyn is the new building built to house the church, after that; it originally started out on 15th St. in Park Slope. 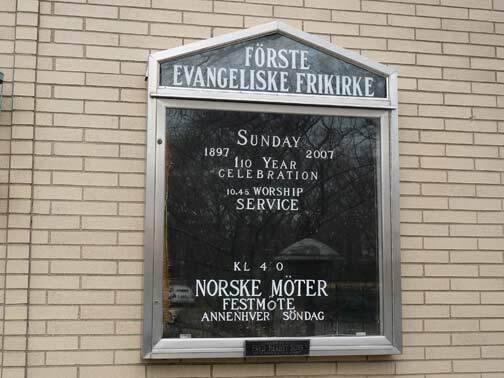 The church was founded by immigrant Norwegians and it has founded – or has affiliations with – ministries to the elderly (Norwegian Christian Home) and the Norwegian seamen (the Norwegian Reading Room) and also founded or affiliated with ministries to single women (a home for them as they came to the U.S. from Norway) and orphans (Norwegian Children’s Home). 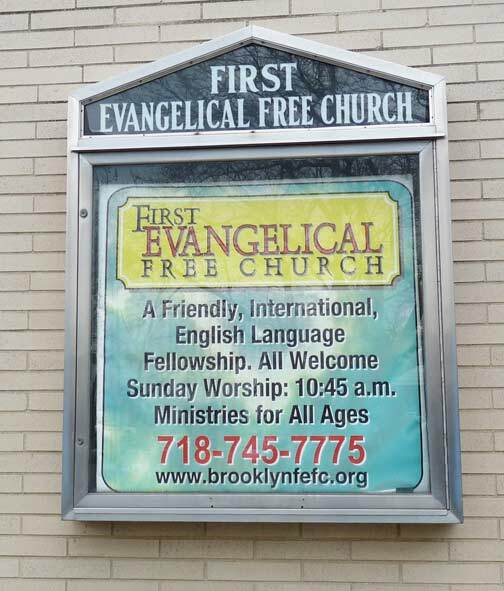 There may be a couple of people yet at First Evangelical Free Church – Brooklyn who might know your family name! Thanks for your helpful and fascinating site. 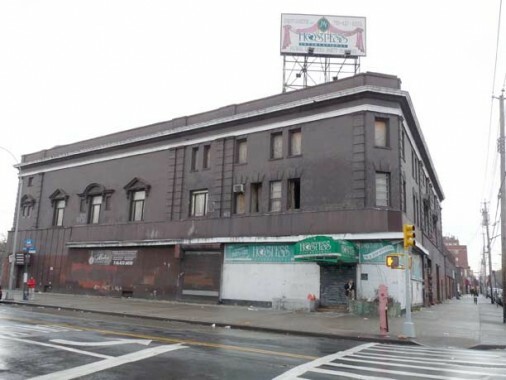 Do any old timers from the neighborhood remember a place called Brand’s Bar and Grill, diagonally across the street from what is now the Irish Haven on 59th and 4th ave? 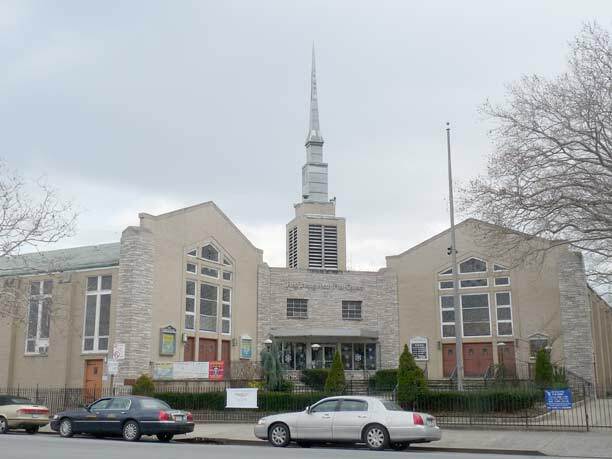 The church at 450-67th was, for a time in the 1980s, St. Andrew’s and they shared the church with a Lutheran congregation whose name I don’t recall. So there would be one Lutheran service and one Catholic service every Sunday. St. Andrew’s was established to serve the tenants of the Bay Ridge Towers. When they raised sufficient funds, they purchased land and built a church on (I believe) Ridge Blvd. St. Andrew’s was a nice, homey church were everyone was made to feel welcome.